Veterans’ Cafe and Grill - assisting vets while serving delicious burgers! I come from a family who has served or currently serves in different branches of the military. My father was a Marine, and my sister-in-law was in the Navy, where she met my brother who is still serving. Because of this, I feel compelled to support organizations that serve our servicemen and women. So when Amy and I had the chance to head to Veterans&apos; Café and Grill in Merrillville for lunch last week, we decided to check it out. The restaurant is located at 7805 Taft Street, not too far from US 30. As Amy and I walked in, we saw red, white and blue streamers, artwork honoring servicemen and women, and an eclectic collection of tables and chairs - which I really liked. Our server promptly greeted us at the door, led us to our table and took our drink orders. As Amy and I looked through the menu, we found it difficult to settle on one thing - everything sounded really good! The menu falls in line with the theme of the restaurant. Many of the selections have service names such as "The E-1 Burger," "The Merchant Marine" and "Petty Officer." In the end, Amy order "The E-1 Burger" and I asked for the "Special Forces Burger." Both burgers came with a pile of perfectly seasoned waffle fries. Amy&apos;s burger was a traditional 1/3-pound cheese burger. It included lettuce, tomato, pickles and onions. 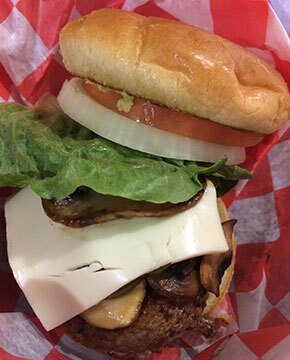 The "Special Forces Burger," a whopping 1/2-pound burger, offered a large selection of fresh toppings including lettuce, tomato, raw or grilled onions, pickles, mushrooms, avocado and jalapeño, as well as a selection of different cheese: provolone, American, Swiss or colby jack. Everything sounded good, so that&apos;s what I got - everything! When our food was set before us, our mouths watered from the smell alone. We both immediately went for our waffle fries. They were hot and delicious, just as we expected them to be. After savoring the waffle fries, we both turned to our burgers. The burger itself had a savory seasoning and was cooked perfectly. All of the veggies were fresh, and the onion and tomato slices were cut thick. I absolutely love a thick, fresh slice of tomato on a burger! I don&apos;t typically order burgers from restaurants because I don&apos;t find their ingredients to taste as good as burgers off of a grill, but Veterans&apos; Café and Grill&apos;s burger definitely proved to be amazing. The meal was satisfying and filling. Leaving after a scrumptious meal and pleasant experience, I know I will be returning to Veterans&apos; Café and Grill. 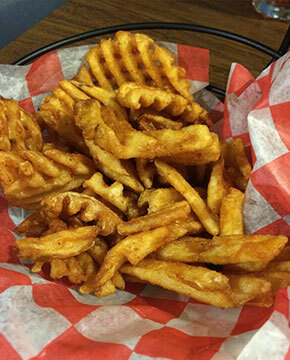 From their list of starters, I&apos;d love to try the cinnamon maple waffle sweet potato fries - they sound delightful! On Sundays, the restaurant also features the "Southern Flare Special," which includes a variety of items such as fried chicken, smothered chicken, mashed potatoes, sautéed collard greens, whipped maple cinnamon yams and more. That lineup sounds too good to not experience. While the food and service were both exceptional, the thing I enjoy most about Veterans&apos; Café and Grill is knowing that it serves a great cause. The restaurant&apos;s motto is to give heroes a hand up, not a hand out. The owner, Brian Cody, wants to help veterans find work, learn skills, and inspire them to possibly become entrepreneurs. The restaurant is also connected to Veterans&apos; Life Changing Services. Veterans&apos; Café and Grill prepares two meals a day, at cost, for those who have sought assistance from VLCS. Additionally, at the end of the year, the restaurant donates a portion of the profits to VLCS. If you&apos;re looking for a great meal that supports a great cause, be sure to head over to Veterans&apos; Café and Grill. You won&apos;t be disappointed in their selections for breakfast, lunch or dinner!